01.- CUENCA (CITY TOUR) – SARAGURO – LOJA.- At 8:00 a.m., tour of the city named “Cultural Heritage of Humanity”: churches full of magic in their paintings, altars of different tendencies and styles, including the New Cathedral which is recognized as one of the largest and most important in South America . Parks, plazas, monuments, cobblestone streets which bring the Republican and Colonial eras to life. The Turi lookout, a must-visit location from which to see the old and new city divided by one of its four rivers. Also, a visit to the inaccurately named Panama Hats, which are recognized around the world, the Rotary plaza, to look at and/or buy the different forms that craftsmen and women give to wood, ceramics, and woven straw. In the afternoon, we travel to the south, full of large pastures, dairy farms and cropland, mountains and hills. Saraguro, whose inhabitants are believed to be direct descendants of the Incas who came after Tupac Yupanqui; with still unexplored archeological remains. Their clothing is made of black and dark blue wool, a sign of mourning for the death of the last King of the Incas, Atahualpa, who was originally from Quito . Especially stunning are the jewels that the women use to fasten their clothing or their necklaces made of rows of small beads made of seeds strung in a zigzag pattern; the colors, the beads and the number of rows indicate what community the women belongs to. Arrival in Loja in the late afternoon, a town nestled in a valley of the high plans at 2,100 meters above sea level which in 2001 was named the third ecological city in the world. Lodging. 02.- LOJA – (PUYANGO PETRIFIED FOREST) – MACHALA.- At 8:00 a.m., begin a tour of the city: The Cathedral, decorated with interesting sculptures; the churches of San Francisco, San Agustin, Santo Domingo, San Sebastian and Fatima featuring religious works of art; the Bernardo Valdivieso Theater; the Hill of the Virgin with a view of the entire city, plazas, museums and parks like the “Jipiro.” At noon, we will depart for the Puyango Petrified Forest, an area with altitudes of between 360 and 500 m.o.s.l., and an average temperature of 22 .5º C. There are two parks in one, depending on the time of year when one is visiting. It was previously an ocean that dried up, and became populated with plants and animals, and after hundreds of years, due to huge natural cataclysms, remained buried underground. Finally, as a result of geological movements, they emerged to the surface, forming an invaluable example of the planet's remote past. The most recent fossils found date back 500 million years. The main attraction are the fossilized tress which are approximately 100 million years old. According to Shoemaker, the quantity of petrified trunks existing in such a small area represents one of the largest collections of this type in the world. At the end of the day, we will travel to Machala , known as the “World Banana Capital,” since from that city this desired fruit is exported throughout the world. Lodging. 03.- MACHALA (CITY TOUR) – ZARUMA – GUAYAQUIL. - Depart at 8:00 a.m. to visit the picturesque spots of this city; the Abdon Calderon central plaza with its cathedral, residential areas, the Puerto Bolivar (center for exports). The cuisine is spectacular, based on seafood such as shrimps, lobster, squid, or mussels. Nearby is the town of Zaruma, national heritage, famous for its narrow raised streets, full of houses made featuring colonial architecture and beautiful wood-carved balconies that have been conserved over time, with the shapes and forms of a unique architecture that has made it into an attraction for artists, painters, photographers, tourists and aficionados of this rich art form. 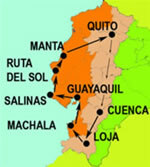 We will leave in the after noon for Guayaquil , founded in 1538, the main port and economic capital of Ecuador . Arrival in the late afternoon. Lodging. 04.- GUAYAQUIL (CITY TOUR).- In the morning, we will tour this city where Simon Bolivar and San Martin met. Bordering the Guayas River , we will admire the new Malecon 2000 (Boardwalk 2000), the Las Peñas neighborhood, with its enchanting colonial style of houses built in wood and forged iron window frames. The Centenario Park , with its characteristic tree iguanas. The Clock Tower, the Old Lighthouse, the Santa Ana hill, etc., and the northern modern and dynamic zone. Afternoon free. 05.- GUAYAQUIL .- Free day for personal activities or to take an optional excursion (Botanical Garden, the Historical Park , the Cerro Blanco Protective Forest , full day tropical hacienda tour, yacht trip on the Guayas River , etc. 06.- GUAYAQUIL – SALINAS.- In the morning, departure to the Eastern-most point of the continent: The Santa Elena Peninsula with its main beach, Salinas . Along the way we can observe typical coastal villages. Arrival and lodging. Free afternoon to enjoy the beach. Dinner. 07.- SALINAS – AGUA BLANCA – ROUTE OF THE SUN.- We will travel north, passing through La Libertad, Ballenita, Valdivia, Montañita, Ayampe and Salango, with stops for taking pictures of the beautiful beaches, low plains, bays and coastal forests to the Sulfur Lake, which gets its name from the fact that it has a 70% sulfur, an inexhaustible fountain of youth that is excellent for preventing the symptoms of conditions like arthritis and rheumatism. Lunch. In the afternoon, a visit to the Agua Blanca community, a small village in which people live very similar to the way their ancestors did: the Manteña culture that buried its dead in special urns, where they were enclosed in their best ceremonial dress and adorned with earrings, necklaces, etc. There is a small museum where we can see pre-Colombian ceramics and photos of some of the current residents, with the same facial features represented in the ceramics. A number of archeological studies have found remains from the formative period (3500 B.C. ), ruins of ceremonial temples, houses and plazas. In the temple, pieces of the famous stone chairs, used by the shamans. Along the way, we will pass the humid and dry forest of San Sebastian , a true paradise of flora and fauna. Dinner. Lodging. 08.- ROUTE OF THE SUN.- Free day to enjoy the beach. ( Options include an excursion to Isla de la Plata: an hour and a half boat ride to the island; depending on the season, on this ride one can see humpback whales (June-Oct). Also known as the poor man's Galapagos, there is unique flora and fauna on this island like the blue-footed boobies. This island is not of volcanic origin, but separated from the continent and lodged there. In the pre-Spanish era, the indigenous peoples used it as a ceremonial center, and it was there that the first vestiges of the Bahia culture was found). Dinner. 09.- ROUTE OF THE SUN – LA PILA - MONTECRISTI – MANTA.- Free morning. ( As an option, we recommend a visit to the Machalilla National Park , with its 55,000 hectares, and a picnic in Los Frailes. Nature hikes to observe the flora and fauna along the virgin and craggy beaches. The interesting thing is that the plant life can be classified into three categories: rainforest, dry forest and very dry forest – in the same place!). In the afternoon, a visit to La Pila, a craft center brimming with creativity that generates economic resources which give the majority of the population the opportunity to live from producing and selling pre-Colombian replicas and other ceramic and clay objects. Then we continue on to Montecristi, where one visit the town's central park and main church. The merchants of Montecristi exhibit and sell crafts made out of tagua, wicker, paper fiber and the famous hats made from “toquilla” straw (raw material for a wide variety of handicrafts and which has not lost its usefulness through the years). Arrival in Manta, lodging there for the night. 10.- MANTA – STO. DOMINGO DE LOS COLORADOS – QUITO.- At 8:00 a.m., departure from the hotel from where we will head toward the interior of the country with its low coastal areas and tropical crops. We will arrive in Santo Domingo de los Colorados, the home of famous shamans (indigenous holy men), which got its name (los Colorados, the “colored ones”) from the distinctive “hat” that the natives make with their own hair and a mixture of plant extracts. Free time for lunch. In the afternoon, we will continue our journey up the Andes and arrive in Quito in the evening. • Personal expenses: laundry, telephone calls, Travel Insurance, etc. • Air ticket UIO-CUE, with taxes.